The 2018 Fall Clinics are available for enrollment. Equine Massage 2-Day Clinic Date October 20-21st. If interested in attending a “How to” clinic in equine massage for horse owners/trainers or potential therapist, call me at 509-246-8053 or email at langleyml@nwi.net to reserve your position in class. 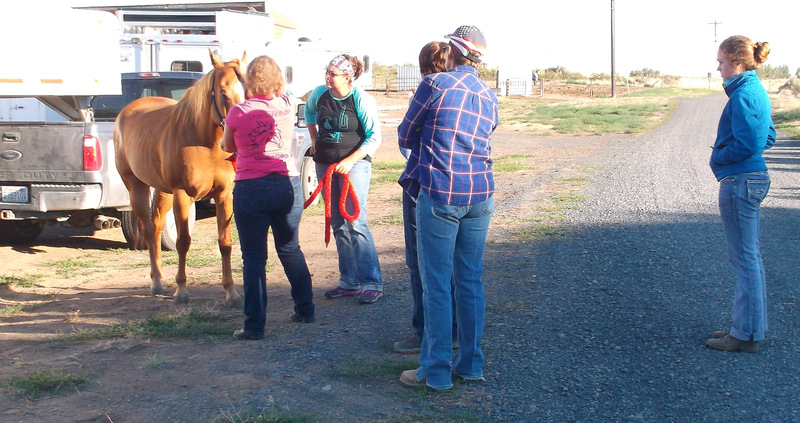 Student Testimony: I had the opportunity to attend the two day equine massage clinic for horse owners last weekend. It was so fun and I learned so much! MaryLou Langley is an excellent instructor and horsewoman. The first day we learned a lot about the anatomy of the horse, skeletal and muscular, tendons , ligaments and fascia… I gained a whole new respect for my riding partner!! It is amazing what we take for granted!! We learned how to spot problem areas in posture, movement and attitude in the horse. 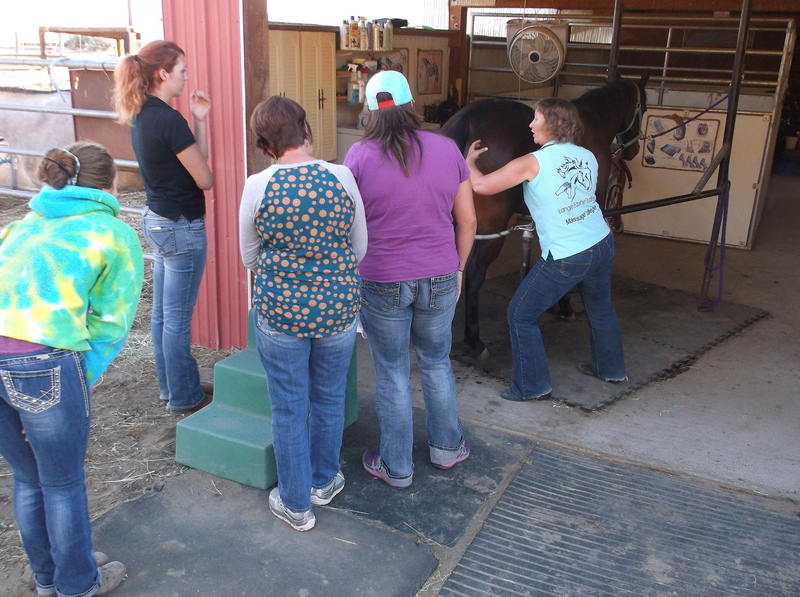 Then we learned by putting our hands on the horse how to feel and detect areas of restriction or soreness. Then we learned all sorts of massage techniques to help our horses recover and move more freely. The hands on learning and practicing all the modalities of massage and watching the horses respond with relaxation, huge sighs of relief,head shakes, yawns, licking/chewing, eyes half closed as they just enjoyed the release of tightness was priceless!!! Then I came home and have been working on my gelding on a hindquarter muscle (that I didn’t even know was so bound up before this clinic) and watch him lean into me and watch the muscle relax and watch his stride improve has been very rewarding. So to sum this up, this was only the two day clinic to help your own horses, it was well worth the investment in time and money!!! There is also a 300 hour course to become certified and legal equine massage therapist that I am dreaming about. Two thumbs up for Langley Equine Studies 👍👍 Thanks so much for the fun, informative clinic, hoping my boys will reap the benefits!!! Sharon Long- Waterville, WA. Student Testimony: Marnee Cleveland says this about Day 1 or our equine massage clinic: Kathy Blatecky and I are in Soap Lake this weekend attending an equine massage clinic!! We did not spend a lot of time on the horse today. It was mostly classroom time going over muscles and the horse skeleton. Several hours into the day and I’m thinking……what did I get myself into!?! BUT…..then, you get to put your Hands on the horse….and then, you find a sore muscle……AND if you are lucky you may apply the right technique to release the tension…and then, you get a happy horse 🐴 ..licking and chewing!! Payment for a day spent in the classroom. learning what it takes to get results!! It is a amazing how the horse responses…to even the inexperienced hands!! Day two tomorrow!! For now, I’m taking my achy, full brain to bed to dream of muscles and massage! I woke up to very sore hands!! I don’t know if this means, I’m not massaging correctly and I’m hurting myself or I just have weak hand muscles. ?..but I continued on….rubbing, pulling, sliding, gliding, squeezing, ringing, needing, skin rolling, hacking and yes, even pummeling!! Where is Tank you ask?? Standing there..enjoying the whole process!! Oh, if horses could smile! He was one happy horse!! I took this clinic, thinking/dreaming, maybe I could do equine massage as a second career? Or just supplement my horse habits!! Well, I have a lot to think about, read, research and practice! MaryLou Langley gave us so much information my brain is on over load! I’m sure she crammed 300 hours of material into two days! If you have ever thought about taking her clinic or her eight month class…..do it!! She is a talented, knowledgeable teacher! You won’t be sorry. For me…it’s practice, practice, practice! The horses, dogs, and husband are going to love me! It’s massages for everyone!! Marnee Cleveland – Okanogan WA.